Inevitability of Reminding Yourself of Gratitude and Holding Memorial Services for Your Ancestors | ISE-HAKUSAN DOU'S "THE UNIVERSE"
Memorial services for ancestors with gratitude are necessary for you to reach the true Christ. A soul of a man who has realized the Self by becoming one with his Inner God breaks into parts infinitely, transgressing the law of cause and effect of the earth, and dwells in all of the spirits of human beings who are born from then on. The same thing can be said about the soul of Christ. A part of his consciousness has dwelled in all of the souls of human beings born on the earth. It dwells in them as the consciousness of “forgiveness” and “tolerance.” Also, Buddha’s consciousness dwells in the souls of the Western people too who have no relationship with Buddhism as that of “mercy.” That is, the more people realize the Self, the higher the level of consciousness of the whole human beings. Even if you were a Christian, you would find it difficult sometimes to bring out the consciousness of “forgiveness.” Why? In the World of Reality, conflicts never seem to end between people or states, whether or not their state religion is Christianity. To feel the consciousness of Christ within yourself, there is a thing you have to do first of all. Where are human beings born from? – mothers. Where are they born from? That is, you are the result of your ancestors having relayed a baton of life without a break since the genesis of the human race. Genetically speaking, all of your ancestors dwell in you. Not having any gratitude or respect to them is denying yourself. As long as you deny yourself, you can never get happiness for ever. Even if you don’t like your parents and ancestors, it was your soul who chose them when you borrowed your physical body from a family line, which you will understand after you die, but it’s too late. It’s not sure if you can have another journey of life, which depends on the way you live in this life. To offer gratitude to ancestral spirits is the most powerful way to influence the spirit world. If your ancestral spirits are restless in suffer, you can console and save them by so doing. Ancestral spirits who have already rested in peace would go up to a higher dimension and help you descendants. As the number of restless ancestral spirits related to you gets smaller, you will come to be able to tune in to the vibration of Christ. To feel the true consciousness of Christ, it is necessary before everything that you console restless ancestral spirits in suffer and send them to heaven. People in the world seek for God neglecting their restless ancestral spirits. As things are, they couldn’t reach God. If you felt something like God with your ancestral spirits emitting negative energy of restlessness, it wouldn’t be true God. A spiritual being in the World of the Dead, which is a world for restless spirits, must be deceiving you. This is true of all of the religions such as Christianity, Judaism, Islam etc. To feel righty and believe in God of your religion too, it’s important to hold memorial services for ancestors. In Christianity, to the best of my knowledge, the concept of memorial services for ancestors is not emphasized very much. But I feel that the states of ancestors do have influences on their descendants all the time in life. This is because human beings are connected to their ancestors through spiritual lines, or genes, all the time. If you were a Christian and your parents or grandparents had passed away with unsatisfied feelings, worries, or attachment to this world in their minds, they would stay around you now unable to go to the spiritual world for Christians. As long as a soul stays in this world with attachment to this world, the state of mind of the moment of his/her death is fixed and hardened as it is in the World of Reality. Though you cannot see your ancestral spirits, you will be affected by the negative energy of magnetism your ancestral spirits emit who stay around you and try to appeal you to do something for them, when you’ll get irritated or mad easily for no reason. With this state of mind, you’ll make a wrong decision and go into vicious cycle by yourself. Also, if a Christian passed away with regrets over things in this world or strong feelings of anger, his/her thought energy would be likely to linger in the World of Reality and they would try to revenge themselves on their enemies unable to go to the spiritual world for Christians. Unable to affect them directly because of the lack of their physical bodies, they would try to make misfortunes happen to them. The problem is what will happen to them after accomplishing their aims. They couldn’t go to the world for Christians however hard they try. Because their spirits have stayed too long in this world, their thought energy of the moment of their death is frozen. Even if they succeed in their revenge, the feelings of anger not disarmed, they would try to lead another person to death. If their feelings are as they are, they won’t see any angels coming for you from the spiritual world for Christians. Because the mind of revenge doesn’t match with the wavelength of angels, they cannot meet each other. They will end up in wandering in this world with the hatred and go to their living descendants after all. Unfortunate ancestral spirits of this kind are invisible, but their descendants are affected by them because they are always flowing around their descendants and giving off magnetic energy of anger all the time. And the descendants are likely to follow the same fate as their ancestors’ after all because they’re always affected by such ancestors’ magnetic waves. There are many cases that descendants lead the same kind of life as their ancestors. Well, to save this kind of unfortunate ancestral spirits, it’s the most effective for their living descendants to offer gratitude to them. Dare to offer gratitude to such ancestral spirits in anger. As descendants don’t know which ancestral spirit is in suffer, it’s better to offer gratitude to the whole ancestral spirits. This is not to worship them just like you worship God. It’s natural for Christians to worship Christ. The memorial service is held to offer gratitude to ancestral spirits with a view to consoling them. In holding it, please offer gratitude of “Thank you so much for keeping us alive” to them, for it is because our ancestors lived in the past that we descendants can be alive now. This way has very strong effects on the invisible world. You must not make any wish to your ancestral spirits. If you do so, they’ll be bewildered and begin to suffer because they cannot make your wishes come true however hard they try. Then the vibration of suffer they emit will have bad influences on you and bad situations will actually appear before you. I feel that in areas where the number of people who have a lot of unsatisfied ancestral spirits is large, there are likely to be a tendency for troubles between inhabitants or accidents to occur. If people can have a large mind full of gratitude each, the society where they live will become peaceful naturally. For each of our minds to be satisfied, it is essential that each of us hold memorial services at home for our ancestors. I’m going to tell you about the way of holding memorial services for souls of animals. I know how you feel when your pet dies and you might wonder where your pet’s soul goes, because I have kept a cross-bred collie dog before. Seeing souls of animals, I feel that it takes centuries for animals to be reincarnated into humans. Frankly, it seems almost impossible. There is such a huge difference and distinction between human souls and animal ones in the spirit world. On the other hand, it is possible for humans to be reincarnated into animals. I have seen some animals who used to be Caucasian in their previous lives. I have never seen any animals who used to be a Japanese or a Jew so far. I’m not sure if I see such animals in the future, though. I feel that this has something to do with a secret of DNA related to the origin of the human race or their dietary habits. Well, a physical aspect and the reincarnation of a soul who resides in the physical body are related, in fact. Also, there are cases that an errand for the holy spirit possess an animal to express his will. But in this case, once his will is expressed, the energy of the holy spirit leaves the animal soon. If you kept the animal outside of your house, put a round bowl to put an incense stick in where your animal would often be and then stand one or two half-broken incense sticks there. If the place is soil, you can stick them into it. If you kept the animal inside of your house, put a round bowl on the floor where your animal would often be and then do the same thing. ※ You don’t need Tanazku（短冊）, or a strip of paper, in either case. If you hold a memorial service for animals that were used for some research or eaten or killed in car accidents for example, stand a half-broken incense stick in the center of the bowl and offer gratitude to them after you hold a memorial service for your ancestors with the use of Yorishiro and three incense sticks and then the smoke is gone. When you hold a memorial service for your pet animal, it’s important not to　empathize with it too much. Please do it formally and calmly. Because animals are born into another world in fast cycle, your sad feelings to try to prevent them from leaving will do them no good. Just see them off positively. The reason why you use an incense stick for animal spirits which is different in length from the one for human spirits is that they go to a different spirit world from the ones human souls go. It is not that the longer, the better. If the smoke of an incense stick doesn’t reach the animals, it means nothing. Laws of nature work like magnet in the spirit world much more than we think. They act on souls according to their levels like human feelings don’t matter at all in a way. You can make the smoke of the incense stick reach your pet animal by showing a different “form” of holding a memorial service from that for human souls. The World of Reality where feelings or compassion is valid is a precious dimension. That’s why it’s sometimes hard to live there, though. When your spiritual body leaves your physical one, you are to be attracted to another world according to the magnetism etched into your spiritual body. I hope you etch good magnetism into your physical body as long as you live. If you do so, you are to go on to another world automatically that matches with the amount of the good magnetism. A lesson lies in the disappearance of incense sticks. They have to be gone once they have graduated from this World of Reality. No matter how much they have attachment to this world, they’re not allowed to stay here. Unless they leave for another world to go to with no regret or lingering affection for this world, they will cause their descendants, living in this world, troubles by clogging up their family lines. Provided that you hold memorial services for your ancestors with gratitude everyday while you’re alive, one of your ancestral spirits you is sure to come for you after you die. Also, provided you have had a lot of ancestral spirits of yours rest in peace, they will come for you as a group.This is because you have made karma (= a cause)of being welcomed by holding memorial services while you’re alive. What you give is given to you. On the other hand, if you haven’t practiced holding memorial services and after you die you cannot rest in peace because of the state of your mind, you’ll be at a loss what to do because there’s no one coming for you.Whatever you do in this world has a meaning and causes some karma. If you do it at all, leave good karma behind. You can choose freely whether you make good karma or bad karma. Seen through the eyes of the holy spirit, lives of human beings are like short plays of a moment. You can play a good role of your own accord and it’s important. What you played never disappears no matter how short it is. But if you force yourself to play, you won’t be able to keep on playing because you’ll be tired. As you practice holding memorial services for your ancestors with gratitude and reminding yourself of gratitude all the time, you will come to feel like playing a good role naturally. As for the words you say in holding a memorial service for your ancestors, you can use your own words or make a change to them as long as they mean gratitude to your ancestors. But I hope that you say “I Ka Shi Te I Ta Da I Te A Ri Ga To U Go Za I Ma Su” meaning “Thank you so much for keeping us alive” because they have an important spiritual meaning. Well, after offering two incense sticks, you offer the third one. This has a spiritual meaning. In the way of Ise-Hakusan Dou, when you have a memorial service for your ancestral spirits and the spirits who have something to do with you, all you need is a Tanzaku（短冊, a strip of paper）or a memorial tablet for spirits to stay at temporarily like a perch with the words “The Place For Spirits Of So-and-So Family” written on it. No matter how complicated the situations you’re in, you have to write your own surname you’re now using on the Tanzaku. If you change your surname, you have to change the name on it, too. 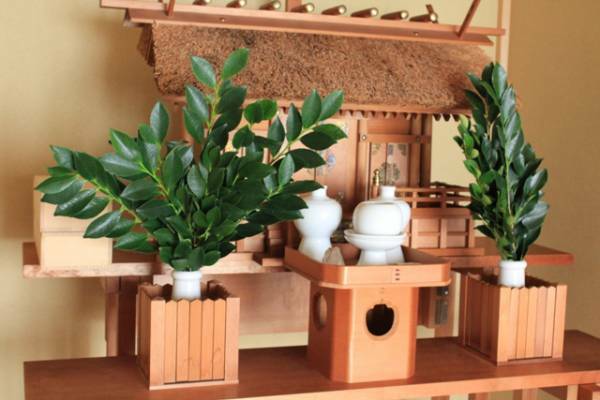 Using Yorishiro（寄り代）, or a place for spirts to stay at, you console your ancestral spirits who have the same surname as yours preferentially.This is because you have to increase the number of ancestral spirits who have been relieved by memorial services and then have them help other related spirits. If you expanded the object of a memorial service by writing your family name and all other related family names on the Tanzaku or memorial tablet, the memorial service would be halfway for each of the family lines and as the result you couldn’t accomplish its intended purpose because the object is too broad. Keep in mind that there are a huge number of ancestors in your family line only. To prevent this, it’s better not to write the names of other related family lines on the Tanzaku intentionally and instead to take care of them by offering the third incense stick. By offering it, you can console the spirits who have something to do with you one by one according to the need. I know from my long experience and spiritual sense that holding memorial services for ancestors does have practical effects on the person who holds it eventually. A lot of spirits who need memorial services are in suffer. They are suffering so much that they afford no ease and reassurance. I learned from a special topic of a TV documentary program I saw before that the biggest factor of fights between prisoners is a little difference of the amount of meals served to them and the order of serving is also important. It’s hard to understand in an affluent, free society, but it could be a conflict of life and death in such a closed space. In the TV program, a prisoner, who was selected from among the prisoners regularly, was checking the amount of each meals with a ruler. This is not a funny thing but a serious matter. The same kind of thing exists between ancestral spirits and other related ones. It’s important to offer two incense sticks to your ancestral spirits first, and after that to offer one incense stick to other related ones. This is not discrimination against spirits. This way of offering incense sticks is to make much of the relationship between spirits and the person who offers them. First you console your ancestral spirits who have the same surname as yours and then have them help other spirits related to you. You can live free with three incense sticks. When you start holding a memorial service for your ancestors, it’s better to do it with the use of three incense sticks from the beginning. I used to explain that you should hold it first with the use of two incense sticks, and after making your ancestral spirits’ protection stronger you should hold it with three incense sticks for other spirits as well as your ancestral ones. But in view of the situations of the World of Reality, I feel that you need to do it with the use of three incense sticks from the beginning. But remember that only if you feel like doing it after reading “how to hold a memorial service for your ancestors,” you should practice it. I’m never recommending you to do it forcibly. If you are worried about or afraid of holding a memorial service, you haven’t reached the stage of consoling spirits related to you yet. What you’re caring about the most is you, which is also an important step for you to develop though. The way of consoling related spirits with the use of a Tanzaku（短冊）, a strip of paper, or a memorial tablet as Yorishiro（寄り代）, a medium for spirits to stay at temporarily, three incense sticks, and words of gratitude is a revelation I received from Kunitokotachi-oh-kami（国常立太神）, the ruler of Meikai（冥界）, the world after death. This way of holding memorial services will have more and more powerful, practical effects on the World of Reality. If you succeed in purifying your spiritual body with your own efforts before it’s too late, you can get through the baptism of spiritual light of the sun―I got this message from above. In holding the service, the first two incense sticks you offer to your ancestral spirits mean that one is for your male ancestors and the other is for your female ancestors, including the spirits of your parents’ family lines. To be exact, the first two incense sticks mean “infinity” expanding endlessly. In the Japanese myths, myriads of deities sprang and branched off from Izanagi（イザナギ） and Izanami（イザナミ）, a couple of husband and wife. So the two incense sticks you offer mean that tracing back your family line, you offer gratitude for “being kept alive” to the Original God ultimately. Wandering spirits who belong to your family line would come close to the smoke of the third incense stick. You, now living, don’t have to worry about the order of their coming or which smoke they will come to. Leave the matter of the spirit world to the spirit world. You yourself would be consoled first and then spirits who need help one by one. Also, there is a big difference in protection among brothers or sisters, depending on whether or not they hold memorial services. If you are married, you might be afraid that only your husband’s ancestors are made much of, but you don’t have to worry about it because spirits related to you who need consolation are sure to be taken care of whether or not they belong to your family line or your parents’ family lines. Take a look at your hands and feet. They haven’t appeared from nowhere, right? Because you have a physical body, you cannot help being affected by the state of your ancestral spirits during your short life. Self-appointed professionals of the spirit world give lectures on God or angels neglecting their own ancestral spirits. A lot of Shintoists also neglect to hold memorial services for their ancestors. It’s impossible to sympathize with a subtle holy spirit if you’re being affected by the wave motions of wandering ancestral spirits. Spirits you can sympathize, with you neglecting your ancestral spirits in suffer, must be spiritual beings in the World of the Dead where wandering spirits live. Human beings have an aspect of foolishness and complexity. Even if you think it’s important in life to study or train yourself, you will suffer all the same when your present state of mind is bad. You cannot carry on the study nor training. As your tooth is hurting, any food will taste bad no matter how expensive it is. If you practice holding practical memorial services in order to make your ancestral spirits rest in peace, your state of mind will come to be stable in this World of Reality. As long as your state of mind is stable, you can do anything you want with efforts and I’m sure your can do it. The reason why you need to hold a memorial service in the the way of Ise-Hakusan Dou is that human beings are forgetful creatures. So it’s important to make it a rule to offer your gratitude to your ancestral spirits as a habit. Without it, you couldn’t keep on holding the services. You’ll stop doing it in just three days. While you’re alive, you can move freely on your own accord. You can do whatever you want, good things or bad. It’s your choice to be grateful to your invisible ancestors, who have passed the baton of a physical body to you. What you did in the World of Reality is much more valuable than thinking. Therefore, what you do is very important. A result caused by your action of offering three incense sticks is far beyond an ideal you think of with twisted logic. If you hold a memorial service at all, you should do it in the truly effective way. Once you do it, you’ll know whether or not this way of holding it is genuine. You’ll have a new experience anyone else never knows. A memorial service held every day is more important than visiting your family’s grave once a year. Bones put in an urn after cremation are only a part of the whole due to the size of the urn when the cremation is done in city. The rest of it are thrown away together with other’s bones. Remains don’t include the soul of the deceased and are nothing more than wreck like the lyric of the song “Don’t Stand At My Grave And Weep”. Are graves unnecessary? No. They’re important all the same. They are important as monuments not to forget ancestors. Human beings are forgetful of holding memorial services for ancestors when they’re busy with their work or everyday lives. But if people have their graves, when the equinoctial week or Obon festival comes around, they will visit them with their family. Without graves, there is no chance to hold memorial services for ancestors with family members. It is a great consolation to ancestral spirits for their descendants to think about them even a few times in a year. If all of your ancestral spirits were in rest in peace, it would be enough for you to visit the grave a few times a year and after that, work hard in the World of Reality forgetting about them. But actually there are wandering ancestral spirits in any family line. Wandering ancestral spirits try to depend on their descendants for help. Then there will happen a lot of troubles in your life because they try to draw your attention to their existence. It is really agony for spirits to stay in this word with attachment to it because the situation of the moment of their death is fixed. If they want to go back to the spirit world on their own, it’s not easy because they have missed the chance to leave. They need help from their descendants in the form of memorial services with gratitude. It’s more important for you to hold a memorial service for your ancestral spirits everyday with gratitude with the use of three incense sticks than to visit the grave a few times in a year. It makes your ancestors happy for you to think about them even a few times a year, much more to think about them everyday at home. If you hold a memorial service for your ancestors everyday, you can make your wandering ancestral spirits rest in peace one by one. And they, in turn, become your guardian spirits and will protect you. What you did for your ancestors will return to you without fail. There may be a case you have separated graves for some reason. In many cases, it is due to the will of the deceased, who doesn’t want to stay together with his wife or her husband after death, for example. This is also due to some karma. Just leave it as it is. Above all, it’s important for you to hold a memorial service everyday for your ancestors whose surname is the same as yours.